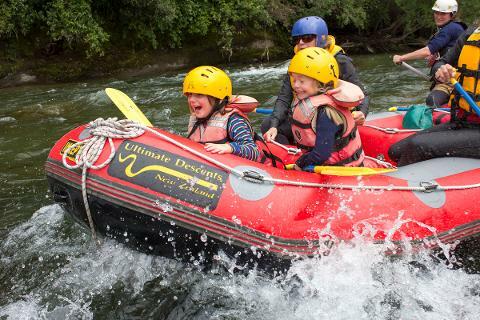 This family rafting adventure is for ages 5 years and up. Tours at 9:30am and 1:30pm. A stunning stretch of river which meanders through amazing bush and mountain scenery. Everyone who wants to, has the chance to paddle. We even have custom made paddles for the smaller rafters amongst you. 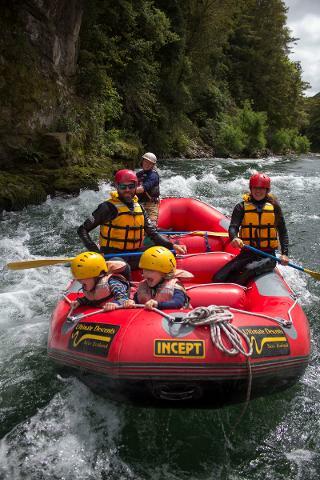 You will have a taste of riding the rapids, then drifting through crystal clear pools to take in the breath-taking backdrop of your very own family adventure. There is also the opportunity for the kids to have a swim and jump from the rocks, in a placid section of the river. Catering for children, this gives even the youngest travelers an opportunity to experience river travel in a safe and enjoyable manner.